The best of an oil and lotion in one. Easy slip, nongreasy, arnica and ivy extracts stimulate circulation and help heal bruises. PLEASE NOTE-Gallon Sizes are limited 2 gallons maximum per order in shipment, whether its 2 gallons of the same item or gallons of mixed products throughout the order.If you exceed the maximum of 2 gallons of the same item or mixed products per order, then the order will ship based upon weight of shipment and will have additional shipping charges that will not show up on your internet order but will be additional to your order and appear on your invoice received from us. This will over ride our free shipping policy over 99.00 and up. PLEASE NOTE-REGULAR SHIPPING CHARGES THAT APPEAR ON THIS INTERNET ORDER DO NOT APPLY TO ANY BULK 5-GALLON PRODUCT PURCHASE.ALL SHIPPING CHARGES ARE ADDITIONAL AND SHIP BY WEIGHT AND DIMENSIONS OF BOX WHEN PURCHASING ANY BULK PRODUCT AND WILL NOT APPEAR ON THIS INTERNET ORDER, BUT WILL APPEAR ON YOUR ACTUAL INVOICE FROM US. 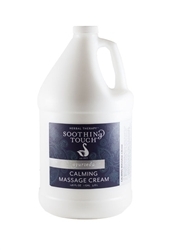 Item#-UNI-ST213.Available i a gallon.Melt away clients' stress by massaging with Soothing Touch Calming Cream. Infused with Kava Kava, St. John's Wort, Valerian and essential Lavender Oil, this rich cream is formulated to completely relax the mind and body. This is an ideal choice for clients whose tension is caused by stress. It has a mild and pleasing lavender scent and will leave them feeling relaxed, rejuvenated and replenished.PLEASE NOTE-Gallon Sizes are limited 4 gallons maximum per order in shipment, whether its 4 gallons of the same item or gallons of mixed products throughout the order.If you exceed the maximum of 4 gallons of the same item or mixed products per order, then the order will ship based upon weight of shipment and will have additional shipping charges that will not show up on your internet order but will be additional to your order and appear on your invoice recieved from us.This will overide our “free shipping policy over 99.00 and up. Item#-UNI-ST223.Available in a gallon.Ayurveda Muscle Comfort Cream includes the stimulating and healing qualities of Peppermint, Clove, Eucalyptus and Calendula. The perfect formula to heal and energize strained muscles and joints. 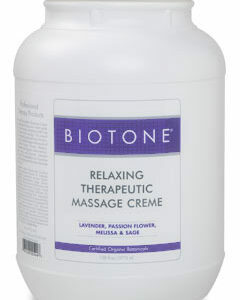 Great for sports massage.“PLEASE NOTE-Gallon Sizes are limited 4 gallons maximum per order in shipment, whether its 4 gallons of the same item or gallons of mixed products throughout the order.If you exceed the maximum of 4 gallons of the same item or mixed products per order, then the order will ship based upon weight of shipment and will have additional shipping charges that will not show up on your internet order but will be additional to your order and appear on your invoice recieved from us.This will overide our “free shipping policy over 99.00 and up. Item#-UNI-ST233.Available in a gallon.Bring harmony to the elements of the body with Soothing Touch Balancing Cream. This all-purpose, unscented cream is Ayurvedically formulated to balance the Water, Fire and Ether elements in the body. Infused with the harmonizing elements of Chamomile, Comfrey, Arnica, Ginger and Gotu Kola this cream brings balance to the body and mind and is an ideal all-round unscented massage choice.PLEASE NOTE-Gallon Sizes are limited 4 gallons maximum per order in shipment, whether its 4 gallons of the same item or gallons of mixed products throughout the order.If you exceed the maximum of 4 gallons of the same item or mixed products per order, then the order will ship based upon weight of shipment and will have additional shipping charges that will not show up on your internet order but will be additional to your order and appear on your invoice recieved from us.This will overide our “free shipping policy over 99.00 and up. Item#-UNI-C689OT.Available in a gallon.Nutri-Naturals Massage Creme has a rich texture with generous glide and provides a light, clean finish. It nourishes and softens the skin, promotes healthy new skin cell growth, and gently seals in moisture. Very light, garden-fresh scent.“PLEASE NOTE-Gallon Sizes are limited 4 gallons maximum per order in shipment, whether its 4 gallons of the same item or gallons of mixed products throughout the order.If you exceed the maximum of 4 gallons of the same item or mixed products per order, then the order will ship based upon weight of shipment and will have additional shipping charges that will not show up on your internet order but will be additional to your order and appear on your invoice recieved from us.This will overide our “free shipping policy over 99.00 and up. Item#-UNI-C6885T. Available in a gallon. 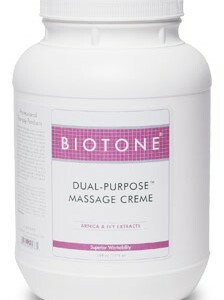 Healthy Benefits Massage Creme is a rich, thick formula with powerful anti-oxidants of Pomegranate, Green Tea, White Grape and Grapeseed. Known for their ability to protect and restore, these active botanical extracts deliver nutrients to the skin, promote healthy circulation and help fight free radicals. Can be used for all modalities from high glide circulatory to slow deep-tissue. Natural oils of Pomegranate, Soy and Rice Bran soften, soothe and protect. Gives a silky smooth glide with less reapplications to ensure continuous contact. Paraben-free. 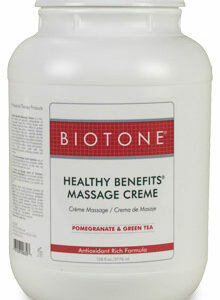 Key Ingredients: Pomegranate, Green Tea, White Grape and Grapeseed extracts. Pomegranate, Rice Bran and Soy oils. Rich, thick formula for all modalities from high glide circulatory to slow deep tissue. Silky smooth glide with less reapplications and continuous contact. PLEASE NOTE-Gallon Sizes are limited 4 gallons maximum per order in shipment, whether its 4 gallons of the same item or gallons of mixed products throughout the order. If you exceed the maximum of 4 gallons of the same item or mixed products per order, then the order will ship based upon weight of shipment and will have additional shipping charges that will not show up on your internet order but will be additional to your order and appear on your invoice received from us. This will over ride our free shipping policy over 99.00 and up. Item#-UNI-C435T. Available in a gallon. 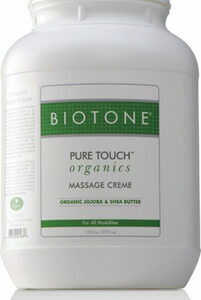 Pure Touch Organics Massage Creme provides rich thickness hypo-allergenic qualities, in an unscented creme. Can be used for all modalities from high glide circulatory to slow deep tissue. Organic, paraben-free and gently pH balanced, assures the therapist of the highest quality and purity. Organic Jojoba Oil and Organic Shea Butter rich in Vitamins A, E, & F, combined with Organic Chamomile Botanicals, provide skin nourishment along with soothing and healing properties.““Organic Sunflower and Sesame Oils give added skincare benefits and deep hydration. Non-greasy finish. Pure Touch Organics is not pumpable. Key Ingredients: Organic Chamomile Botanicals, Organic Sunflower oil, Organic Decyl Cocoate, Organic Shea Butter, Organic Jojoba Oil, Organic Sesame oil, Organic Safflower Oil, Hypoallergenic, Paraben-Free““Organic, environmentally friendly ingredients, hypoallergenic and paraben-free. PLEASE NOTE-Gallon Sizes are limited 4 gallons maximum per order in shipment, whether its 4 gallons of the same item or gallons of mixed products throughout the order.If you exceed the maximum of 4 gallons of the same item or mixed products per order, then the order will ship based upon weight of shipment and will have additional shipping charges that will not show up on your internet order but will be additional to your order and appear on your invoice received from us. This will over ride our free shipping policy over 99.00 and up. Item#-UNI-C439T. Available in a gallon. Now get the easy glide of oil and the light absorption of lotion in one very luxurious creme. Wonderfully silky, this formula applies like a rich creme and performs like an oil to give you the performance benefits of both textures in one. This formula offers higher friction and less glide than oil yet won’t absorb as fully or as fast as lotions. Perfect for longer massage sessions. Easy to apply, it can pump from a jar. Pump not included.Ingredients: Purified Water, Coconut Oil Ester(Octyl Palmitate), Expeller Pressed Sweet Almond Oil, Expeller Pressed Hawaiian Kukui Nut Oil, Expeller Pressed Canola Oil, Aloe Vera, Expeller Pressed Pistachio Oil, Vitamin E, Vegetable Derived Emulsifying Wax, Methyl/Propyl Paraben (Traditional Mild Preservative), Germal Contains Non-Genetically Modified Oil. PLEASE NOTE-Gallon Sizes are limited 4 gallons maximum per order in shipment, whether its 4 gallons of the same item or gallons of mixed products throughout the order.If you exceed the maximum of 4 gallons of the same item or mixed products per order, then the order will ship based upon weight of shipment and will have additional shipping charges that will not show up on your internet order but will be additional to your order and appear on your invoice received from us.This will over ride our free shipping policy over 99.00 and up. Item#-UNI-C492T.Facial Therapy Massage Creme with Bio-Firming Complex is a blend of firming actives, skin smoothing botanicals and silky emollients. Formulated specially for the areas of the face, neck and decollete. pH balanced, non-comedogenic, and non-greasy, this sensitive skin formula contains anti-aging and firming actives of CoQ10 (firming and toning), Vitamin K (helps reduce the appearance of tiny veins) and Vitamin C (collagen building). Natural botanicals of White Peach, Pineapple Enzyme, Quince and Mango Mandarin help to soften and smooth the skin. Essential oils of Tangerine, Rosewood and Lemongrass provide a fresh light aroma.Use for facial massage and can leave on for maximum hydration.